If you are looking for boats for sale in Spain, Gibraltar or the Mediterranean, or perhaps a used or second hand boat for sale, you will also require the services of a professional and reliable broker, and Boat Sales Spain should be your first port of call. With over 35 years experience of brokering new and used boats for sale in Spain, Gibraltar and the Mediterranean, specifically on the Costa del Sol, and our brokers are experts in identifying and locating the perfect boat or yacht of your choice and managing your purchase from start to finish. Our comprehensive listings of boats and yachts for sale in Spain, Gibraltar and the Mediterranean, whether new or used, motor or sail, encompass everything from motor boat for sale - sailing boats for sale and super yachts for sale, all of which have been selected and pre-checked by our professional team of brokers. Whether you are looking for new or used second hand boats, a small sailing yacht, fast power boats, fly bridge cruiser, sports/day boats, luxury super yacht or classic sailing ketch, our listings of motor boats for sale and sailing boats for sale, cover them all. So, if you are looking to buy a boat in Spain, Gibraltar or the Mediterranean, searching for a new, used or second hand boat for sale, or if you already have a particular boat in mind, why not contact us now for more information on how we can assist you. Call us on +34 626 866 381. The services provided by Boat Sales Spain cover all aspects of buying and selling yachts and boats in Spain, Gibraltar and The Mediterranean, and in addition to our brokerage services, we can arrange moorings, purchase & sales, finance, insurance, shipping, boat deliveries and a full service of boat-care, maintenance and gardiennage. Our services include: Locating boats of your choice, arranging sea trials, mechanical inspection and marine surveys, negotiating with owners, suppliers and lawyers, preparing, checking and approving sales/purchase contracts, organising registration and title paper work, and finally arranging delivery and berthing. If you would like us to list your own boat for sale in Spain, Gibraltar or The Mediterranean or even manage and maintain your existing boat in your absence, whatever your requirements, we have the infrastructure to professionally deal with your needs. We need more boats. If you have a boat you want to sell, why not give us a chance to broker it for you. Click here for more information. We have a wide variety of boats for sale including all the most popular makes and models. Use our search facility below to find what you are looking for. If there is a specific model you are looking for, just let us know and we will try to help. 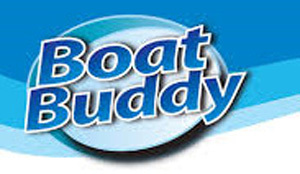 As the distributor of Boat Buddy cleaning products in Spain Click here for more information. Smartphone users can view our list of boats by scanning this code.